We are so lucky here at CCiS Caring for me that lovely individuals want to help fundraise for us. 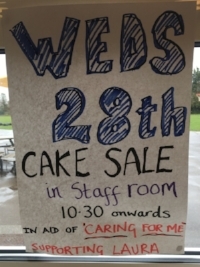 Laura raised a whopping £177 through a cake sale at the school she works at. Below is Laura's story and why she felt the need to 'give back' to us at CCiS Caring for me. "In March 2017 at the age of 43 I was diagnosed with triple negative breast cancer. My cancer journey from diagnosis in March has included numerous tests, appointments, eight rounds of chemotherapy, a mastectomy and breast reconstruction. Despite still needing further reconstructive surgery, my family and I feel incredibly fortunate that I am now on the mend! I have recently started some acupuncture and counselling through Caring for me. I have to admit being dubious to the benefit of either of these but both are helping me in my quest to find and adjust my new normal. If you would like to get involved in fundraising for us please be in contact! Exciting start to the New Year! A whole lot of mud! Is singing the best medicine?